The result was utter devastation as whole villages were submerged in a sea of sludge leaving survivors to clamber onto available rooftops and tree branches. Below them, a macabre sight of lifeless bodies of men, women and children who were not spared by the wrath of the surging water. The exact number of dead and missing from the dam collapse is still a mystery mainly because of the complexity with regards to the rescue operation. Rescuers face an uphill battle given the perplexing geography and inaccessibility of some affected areas. According to Kumriang Authakaison, head of the rescue mission, as of 28 July 2018, eight people are confirmed dead and 123 missing. The United Nations (UN) estimates that the disaster has affected close to 11,000 people. Hydropower has been an important symbol for the people of Lao PDR, so much so that it even adorns their banknotes. The International Hydropower Association (IHA) estimates there to be 26.5 gigawatts (GW) of theoretical hydroelectric power capacity in the country. As of 2016, Lao PDR has an installed capacity of 4.17 GW leaving a gap of around 22.3 GW in unrealised power potential. 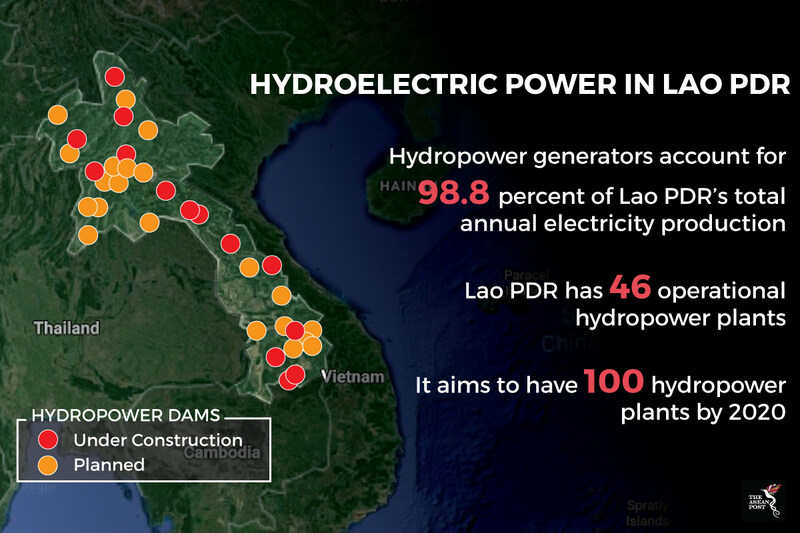 Thanks to this immense untapped potential, the country has begun capitalising on hydropower to fulfil its epithet as Southeast Asia’s “battery.” Moreover, the geographical terrain there gives it an upper edge. Monsoons from two different directions – from the Gulf of Thailand and the Gulf of Tonkin - results in high precipitation and creates favourable conditions for hydropower generation. Currently, Lao PDR exports 67 percent of all its hydropower generated electricity, accounting for almost 30 percent of its total exports. Its main customers are neighbouring Thailand, Vietnam and Cambodia. Thailand signed a power purchase scheme outlining an agreement for Lao PDR to supply the Land of Smiles with 7,000 MW of power by 2020. This comes on the heels of rapid development in Thailand which has increased the country’s demand for electricity. Similar economic conditions have also resulted in Vietnam and Cambodia inking bilateral deals with Vientiane to supply them with 5,000 MW and 200 MW of electricity, respectively. While hydroelectric dams may make sense from an economic point of view, they can be bad news due to the high-risk nature of constructing one. Days after the recent dam tragedy, questions are being raised on the quality of the construction of the US$1.2 billion dam. The dam was a joint venture between companies from South Korea, Thailand and Lao PDR. The primary reason for the collapse is said to be the heavy rains due to the monsoon seasons. However, Lao PDR’s Minister of Energy and Mines Khammany Inthirath, says that poor design could have been a contributing factor as well. The accident has prompted additional concerns over the safety of other dams – whether completed or under construction – in the country. Due to its geography, Lao PDR is highly susceptible to climate change and natural disasters. Global temperatures have been on a steady rise which has increased the amount of water vapour in the atmosphere thus causing more intense downpours. Combined with substandard construction materials, it could point to a plausible reason for the dam’s failure. Damming also causes a host of other issues which affect the livelihood of villagers who depend on the river for their sustenance. “Most of the dams are built by foreign companies and Lao PDR authorities don't have expert knowledge and management to check for weaknesses or problems, that's our worry,” villager Si Wonghajak told the media. In a report by the intergovernmental Mekong River Commission, the long-term impact of hydropower projects in the Mekong basin could result in a steep decline in fish catch to the tune of US$1.57 billion. It is also forecasted that rice production costs could increase by as much as US$950 million. As a result, communities living downstream could face potential hardships resulting in rising levels of poverty. Food security there could also be negatively impacted. In Lao PDR’s pursuit of economic development there are bound to be risks. But unlike financial risks which can be mitigated by some way or form, human risks are a different story altogether. The loss of human life constitutes an unserviceable debt to families who have lost a parent, child or relative. It is a burden that governments should actively work towards eliminating.